Like many newlyweds and expecting parents, the love radiating between Tigist and Abebaw is evident. But the consistent physical care and service Tigist offers her husband is the kind that is not commonly required of young couples—and shows just how extraordinary this woman is. Abebaw is paralyzed, and Tigist is his primary caregiver. He became paralyzed 12 years ago. 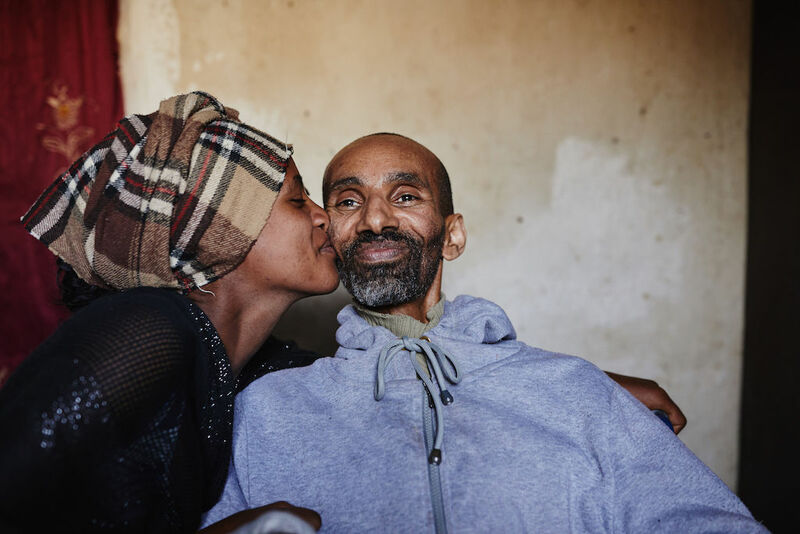 With extremely limited access to healthcare, he was suddenly unable to work and his quality of life declined rapidly and significantly. The couple met two years ago when a mutual friend introduced them. Tigist began visiting regularly to care for Abebaw. “I am happy because I feel like I am serving God by taking care of my husband,” Tigist says. 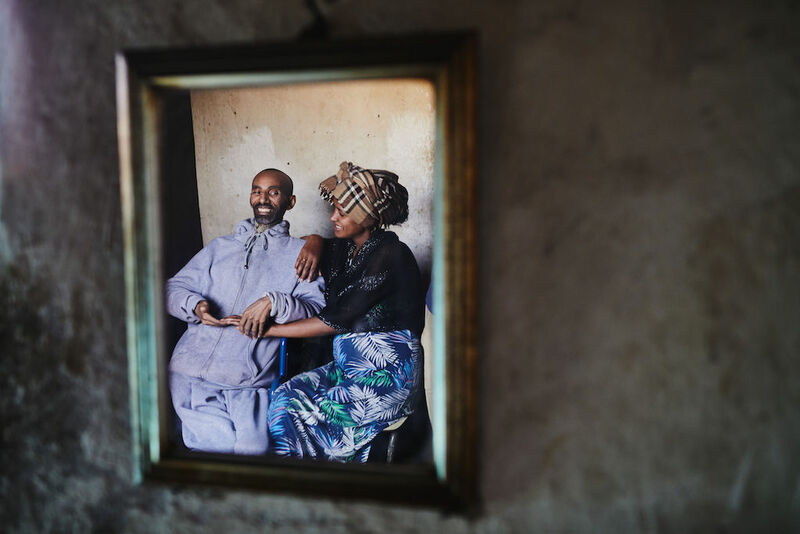 Tigist and Abebaw sit together in their home. Tigist can trace her heart for caring for people with disabilities back to her childhood. “When I was growing up, I used to see a lot of people with disabilities on the streets begging. I used to wonder how people could live in such a condition. I became really passionate about helping and serving people with disabilities,” she says. She also has a lot of experience making sacrifices to care for those she loves. When she was 14, two of her brothers died in an accident, and her sister became very sick. Tigist had to drop out of school to care for her sister. Tigist is pregnant with her second child—the couple’s first together. It was joyous news for both of them. “I was very happy because my husband is able to have his own child. He gets to have this joy in this area of life. I was very happy that I could give him that gift,” Tigist says. Tigist and Abebaw joyfully anticipate the birth of their first child together. 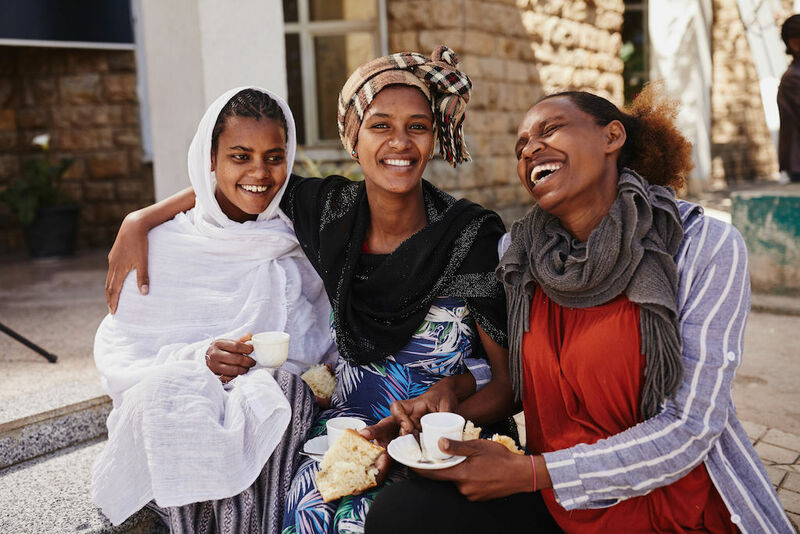 As part of Compassion’s Survival program at her local church in Addis Ababa, Ethiopia, this woman who faithfully serves others has now found support for herself in what she describes as a “sisterhood”. During her first pregnancy—with a daughter who is now six years old—she had little support, and often felt alone. But now, being enrolled in the Survival program has helped provide her with medical care, training, nutritional support and—most significantly for Tigist—a support system of other women and parents. “When I come to the Survival program, I feel like I have my sisters. Tigist fellowships with some of the other moms at the Survival program’s weekly coffee ceremony. A major part of the activities at the Survival program each week is the traditional Ethiopian coffee ceremony. Each week, the moms—and some dads—share coffee and break bread together. But it isn’t the refreshments that make this the highlight of their week—it’s the fellowship. Tigist is used to taking care of everybody else. But now, she has a community who can care for her, too. 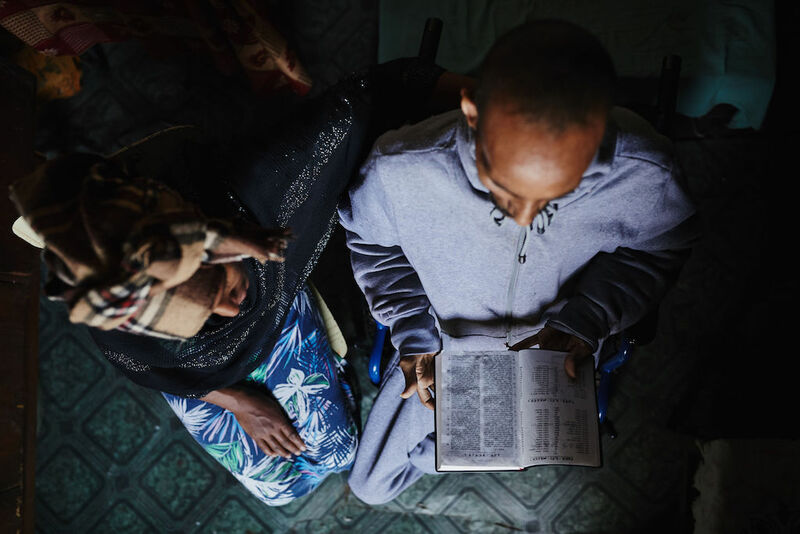 Tigist and Abebaw read scripture together in their home. You can help new mothers like Tigist find their sisterhood through Compassion’s Survival program today. Words by Alyssa Esparaz; photography by Ben Adams. Alyssa brings her passion for youth, justice and Jesus to her role of Writer and Communicator at Compassion Canada, as she works to inspire and equip the Church to live compassionate lifestyles. Her favourite things in the world include her family, basketball, ice cream and riding on airplanes.